Bobcat released the new S595 skid-steer loader. With a 2,200-pound rated operating capacity (ROC), this model has the highest ROC of any of the 500-series loaders. A standard feature for the S595 skid-steer loader is two-speed travel, with a top speed of 11 mph. S595 skid-steer loaders come with standard controls, and the Advanced Control System and Selectable Joystick Controls are available as options. Additional options include an enclosed cab with heat and air conditioning, radio, deluxe instrumentation and hydraulic bucket positioning. According to Bobcat, the cab-forward design moves the operator closer to the attachment and provides visibility in all directions. 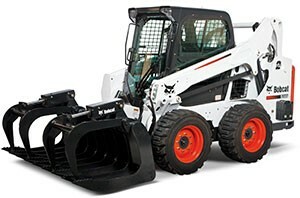 Sixty Bobcat attachments are approved for use with S595 skid-steer loaders. Owners can purchase the optional high-flow auxiliary hydraulics or the Power Bob-Tach attachment mounting system to change nonhydraulic attachments without leaving the loader cab.